Few students have traveled farther than Justus Uwayesu ’18 to reach a Harvard classroom. A native of Rwanda, Uwayesu lost both parents in the 1994 genocide, and at age 7 walked from his home village to the capital of Kigali, where he found himself living in a garbage dump. When a humanitarian visited and asked what she could do to help, Uwayesu told her he wanted to go to school. The educational journey he began that day will come to an end next year, when he receives his diploma from Harvard College. 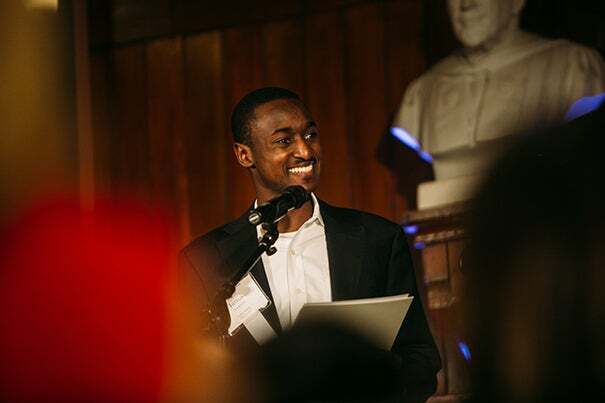 “When I was done with high school in Rwanda and deciding where to go to college, I chose Harvard,” said Uwayesu, a recipient of the Betsy and Alan Cohn Scholarship Fund. “I chose Harvard for its reputation for producing leaders dedicated to their country’s futures, but, frankly speaking, it was also one of the few colleges I could afford to attend. Uwayesu told his story during the Celebration of Scholarships dinner, which brought together students who benefit from financial aid and donors who support the program. Held in Annenberg Hall, the 11th annual dinner was co-hosted by Financial Aid Campaign Committee co-chairs Tim Barakett ’87, M.B.A. ’93, and Michele Barakett, Lloyd C. Blankfein ’75, J.D. ’78, and Laura Blankfein P ’16, ’10, ’08; Ken Griffin ’89; and Jerry Jordan ’61, M.B.A. ’67, and Darlene Jordan. It featured comments from Edgerley Family Dean of the Faculty of Arts and Sciences Michael D. Smith and Dean of Admissions and Financial Aid William R. Fitzsimmons, both of whom extolled the financial aid program as being among Harvard’s most important. Among the donors who spoke was co-host Lloyd Blankfein, chairman and CEO of Goldman Sachs, and a financial aid recipient as an undergrad. “I started my experience with financial aid with a great sense of gratitude for having received aid,” he said. “And I know students today still feel that way, because just a few hours ago, I met with recipients [of Blankfein family scholarships] and they expressed their appreciation. For the students who receive it, the impact of financial aid is incalculable. Harvard was always at the top of the list for Fitchburg resident Michael Richard ’17, a recipient of a Gerald Jordan Family Scholarship, but it initially seemed as though attending wasn’t in the financial cards. As the child of a single parent who’d been forced to retire from her job as a nurse following an injury, coming to Harvard wouldn’t have been possible without aid. It was an experience shared by junior Christina Zeina ’18. Though she’d visited the Boston area with her sister, who attended Boston College, the notion of attending Harvard herself was a “pipe dream,” said Zeina, who receives aid through the John Francis O’Brien Scholarship Fund. “I remember telling my dad, when I applied early, ‘Are you sure there’s no deadline for community college enrollment? Because this is definitely going to be a rejection,’” she said. “But when I read the email, I burst into tears. I called my sister and she said, ‘It’s OK, rejection is part of life,’ and I had to tell her I was crying happy tears. Following her graduation next year, Zeina hopes to attend medical school, a path that might not have been open to her were it not for financial aid. That same freedom also allowed Richard to pursue a degree in economics and find his passion in public service.